Equity crowdfunding could open up a whole new world of investment in small business. Are you ready? I have spent more than a decade as an investment analyst for both individual investors and large private capital firms. One thing I can tell you, the market is far from fair. Rules by government regulators keep individual investors out of the market for start-up financing and private equity. While most investors are reaching for gains of 7% or less through stocks and bonds, venture capital and private equity firms are investing in early-stage companies for huge triple-digit returns. There are risks to these types of investments but all investing is inherently risky and there are ways to limit your risk. But individual investors are not allowed to take those risks…until now. The eventual passage of Title III of the JOBS Act will open up a whole new world of investment to regular people like you and me. Not only will it allow tens of millions to profit from investment in start-up companies but the increase in funding for small businesses could help the economy shoot higher. On Crowd101, you’ll find all the information you need to analyze crowdfunding projects and invest for market-beating returns. We’ll also cover important topics for supporters of donation-based crowdfunding campaigns. Check out our Investors and Supporters category for all our posts on crowdfund investing or supporting a campaign. 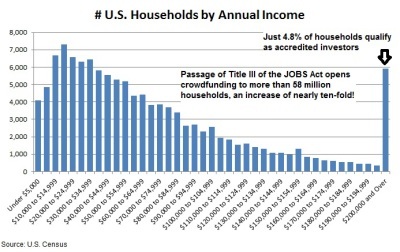 What are you really getting with equity crowdfunding? How is real estate crowdfunding leading to a development boom? Want to know where crowdfunding is going next? Check out our view ahead post into crowdfunding 2016.